Jenewein Group news on Facebook. Visit Jenewein Group Twitter channel. Interests from Jenewein Group on Instagram. Jenewein – Amrop – Fipra – EPPP on YouTube. Since its foundation in 1990, Jenewein Group has been providing top-level complex services. Jenewein Group offers comfort through one single Czech-Slovak group. Jenewein Group does not know any limitations and always tries to meet all challenges. Thanks to its international background, Jenewein Group extends beyond the Czech and Slovak borders. Through Business Innovation Network we combine the best that is to be found on the market. Thanks to the synergic effect of top level professionals and experts, of their approach, knowledge and experience, we are able to deliver a complex, effective and innovative solution. We consider innovations as an investment, progress and added value to everything we do. We innovate our consulting products and our own processes through work teams within our internal Business Innovation Practice and also at the group level. We are a premier Czech-Slovak Consulting Group, which has been proudly and successfully executing the strategic vision of our founder Dr. Jean-François Jenewein. Since 1990 we have gradually earned a reputation of a trusted and experienced partner who delivers Results-Driven Solutions and Strategies in all key practice areas. 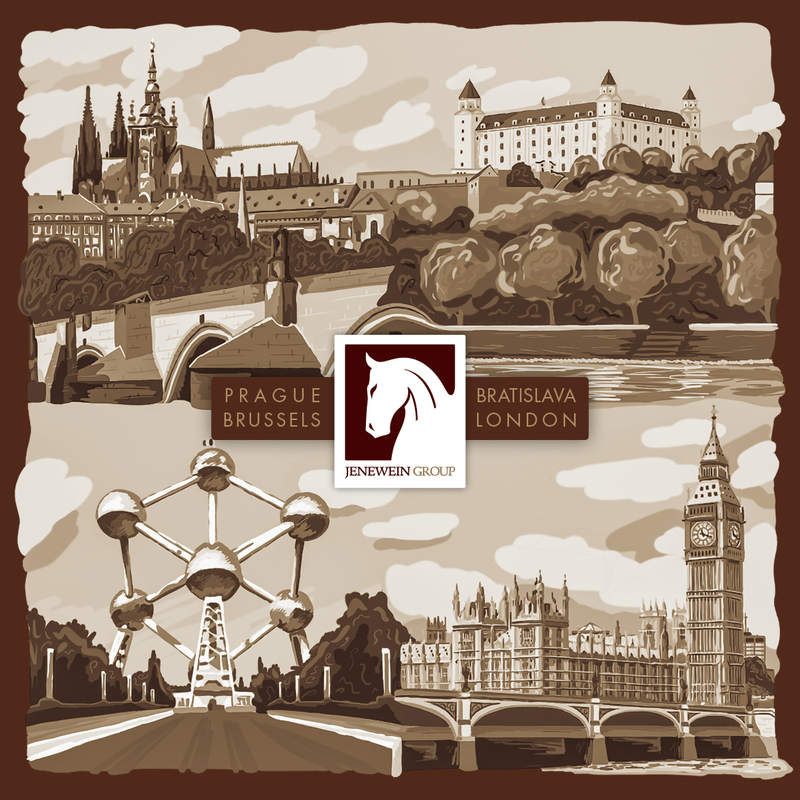 Through our offices in Prague and Bratislava and international presence in Brussels and London we manage to keep a finger on the pulse of latest developments and thus offer proven experience combined with innovative expertise in and beyond the central European region. We have many clients including international companies, Czech and Slovak companies, investors, family businesses, as well as the public and non-profit sector. Our team of partners and senior consultants is committed to creating mutually beneficial partnerships and building long-term relationships. Through selected job vacancies that are part of our current consulting solutions, we offer new career opportunities and challenges. Start or restart your career, use your talent and potential to fulfill your ambitions. If you are interested in any of the offers that you won't find anywhere else, send us a motivation letter and a CV in Slovak, Czech and/or English language to the contacts in our original tool – jenewein brief. We'd like to know your experience, ideas and enthusiasm. Our Czech-Slovak operation, international reach and almost thirty years of history ensure that the information we provide will be treated confidentially, individually and comprehensively. We will put your profile in our database and if you won't succeed in the current search and selection, you will always be at the center of our attention in future projects. At Amrope, we are committed to creating a fair working environment that does not discriminate between jobseekers based on nationality, color, or other criteria, so we have decided to become one of the main partners of the prijatelni.sk campaign to promote Roma employment, launched in mid-February this year by OZ Divé maky. With this bold initiative, young Roma talents are given the chance to educate and develop their skills. The President of the Slovak Republic Andrej Kiska also awarded the campaign's representatives, including Amrop's partner Ladislava Molnárová. In Jenewein Group, we took this year’s advent time in completely different spirit than in last years. We stayed at home – on our backyard on Štefanovičova Street, where we had a pleasant pre-Christmas atmosphere on December 5, 2018 from the forenoon until the late evening with hot drinks and tasty traditional dishes, but especially with colleagues, friends and many guests who stopped at us. Good mood, nice people and enriching interviews combined with the thanks for what we have achieved in 2018 – that’s what our year-end event Advent Get-Together was like. We run to help for children on Sunday, September 9, 2018. Amrop was actively supporting one of Children's Safety Line’s main events – the run 21 km for children. Already for the ninth time during the whole summer we were uniting our partners, clients and general public for a good cause with the common logo Corporates for children. THANK YOU! Moreover, more than ever, we were focusing on the spread of the run from Bratislava’s Partizánska lúka – the runners could join us anywhere in Slovakia. The only thing they could do is to support Children's Safety Line and do a running training or corporate running event for it. Let's help those, who help others. Innovation Day: How to grow with modern technologies? Advisory and analytical institute European Public Policy Partnership (EPPP) co-organized the unique event Innovation Day: How to grow with modern technologies?. It was dedicated to those who are interested in starting their business and want to use maximum of opportunities that modern technologies offer to this goal. Project was executed in the framework of Ministry of Economy’s Programme for Support of Internet Economy. Its goal was to improve the conditions for use of online tools and make internet economy popular. The statement based on headline is one of the findings of extensive global research realized by Amrop. Members of the board, presidents of companies, general directors were respondents of the research... Over 360 leaders took part in the survey, of which more than three quarters are working in companies with international expertise. The editorial office of the expert monthly magazine HR Forum has been talking about individual findings with Steffi Gande, global director of research and marketing at Amrop. The pressures surrounding digital disruption and security are intensifying. And the digitization debate is gathering pace. Yet when it comes to exactly how organizations are addressing digitization, the picture remains fragmented and multiple questions surround its role. In the 2nd half of 2016, Amrop mapped the digital competencies of 300 boards (top 20 stock-listed companies in 15 countries in Europe, plus the US). We looked at the profiles of 3,342 board members. We supplement our analysis with interviews conducted during 2016 and 2017 with board members of listed organizations. Any credible career should follow an uninterrupted, upward trajectory, or so the assumption goes. Many hiring organizations, executive search firms and leadership candidates still exercise this kind of ‘up or out’ thinking. Yet a growing number of successful executives are seriously questioning What’s Next. Over the past 25 years of its operation Jenewein Group with the consulting firms Amrop and Fipra has significantly contributed to shaping the market of personal, respectively management consulting and development of various disciplines of management and leadership in Slovakia. For this reason, we have the immense pleasure from the fact that we have been actively involved in the issuance of a special supplement of the weekly Trend, entitled 25 Years of Entrepreneurship, which represents 27 personalities – representatives of the strong generation of Slovak managers and their success stories. The advisory and analytical institute European Public Policy Partnership (EPPP) in cooperation with consulting company Amrop and Slovak Business Agency has carried out qualitative research among Slovak family businesses. Its research results summarized into a study Family business does (or not) stay in the family. The aim of the study is to open discussion about family business problems, legislative shortcommings related to family business as well as in the area of internal setting up of the family in favour of the family business. In our lands, more and more Family Businesses, mainly established in the 1990s, whose founders are gradually retiring, are going through the process of generational exchange. But how to approach a generational exchange with a cool head and how to handle it without family dramas? How to prepare for a business pension? Mario Fondati, Amrop Managing Client Partner and the guarantor of cooperation with Family Businesses, also comments on the topic for the podnikajte.sk portal. In the world of work, the ability to cope with the uncertainty, ambiguity and volatility of the business environment is crucial. The mission of human resources is also changing – Human Resources Manager is perceived as a strategic partner of top management. At the same time, he must be the link between management and employees. And this also has an impact on the expectations of personnel departments and their bosses. In a series where we are introducing nine key positions for the organization and the profile of the optimum candidates who will surely star in them, we continue with HR Officers & Professionals. Slovakia´s GDP grew by 4,3 % in 2018. In February, FinMin analysts estimated 2019´s growth at 4 %, down by 0,5 percentage points compared to the previous prognosis. Real wages are expected to grow by 4 %, while the unemployment rate should decrease to 6 %. This should reduce the pressure posed by the lack of a labour force, the most frequently cited problém employers faced in 2018, along with legislative changes that increased costs and red tape. Also, Igor Šulík, Managing Leadership Partner at Amrop and Miroslav Jankovič, Senior Client Partner of Jenewein Group gave in annual publication, the Career and Employment Guide, of The Slovak Spectator their opinion to this topic. FIPRA – Foresight International Policy & Regulatory Advisers – leading and at the same time the largest European consulting network operating in the field of public affairs, is preparing a regular European-wide newsletter European Elections Review. It closely monitors the situation before the European Parliament elections in 2019, while focusing on an analysis of the European Parliament's new dynamism expected after the elections, representing current and potential Members of the European Parliament and bringing actual information from the Member States. The consulting company Fipra Slovakia is behind the text analyzing the situation in Slovakia. The innovations in HR are progressing slowly. It is this fact that causes many companies wrinkles on the forehead – every day they must come up with new approaches and procedures to identify and attract new employees. One of the possible innovative solutions that can help the company to discover even the hidden talents and attract them, is the digitization of recruiting. Read the article on the website podnikam.sk, which presents the Slovak startup CapaCV. It is exactly the first one to embark on a journey of near future. The organizers of the conference NEMÁ DO 2 have prepared a truly rich program. From early morning to evening, Chateau Appony Hotel in Oponice was filled with topics related to economics, business and personal development. Since there has been discussing about mobility, talents and efficiency, the OZ Divé maky prijatelni.sk campaign, in which Amrop Slovakia was actively involved too, also found its place in the program. As part of a presentation aimed at breaking prejudices against the employment of Roma, Ladislava Molnárová, Talent Acquisition Partner at Amrop, also appeared. The Jenewein Group was registered in the Register of Solvent Companies for 2018. This listing confirms that it is part of the business environment elite and is one of the companies that carefully guard its good business name. The membership in the Registry, compiled via the international Bisnode network, is evidence of the Jenewein Group's inclusion in the exclusive category of companies with the most valuable business attributes – seriousness, decency and solvency. The Register of Solvent Companies is used by banks and other financial and other organizations. At the same time, it is one of the ways to acquire new suppliers, investors or business partners from around the world. FIPRA has again confirmed an outstanding quality of services provided. This year, it was again included into the prestigious publication Best in Brussels Report, which is the first and only independent guidebook of lobbying and law companies active in Brussels. In the ranking The Best EU Public Affairs Consultancies & Law Firms Guide 2019 there are 21 mid- to large companies and 12 boutique firms. We are proud that FIPRA, leading and at the same time most extensive EU public affairs advisory network where Fipra Slovakia is a member, was included in the former category. All rights reserved. Jenewein is a registered trademark of Jenewein Group, s.r.o.